For multi-awarded Kapuso comedy actor Michael V, working with GMA News and Public Affairs for the Network? ?s election advocacy campaign "Dapat Tama!" comes at the most opportune time, saying that Filipinos need to get the National Elections right this May. "Napapanahon na kasi. Kailangan na talagang ma-strengthen, mapag-ibayo ? 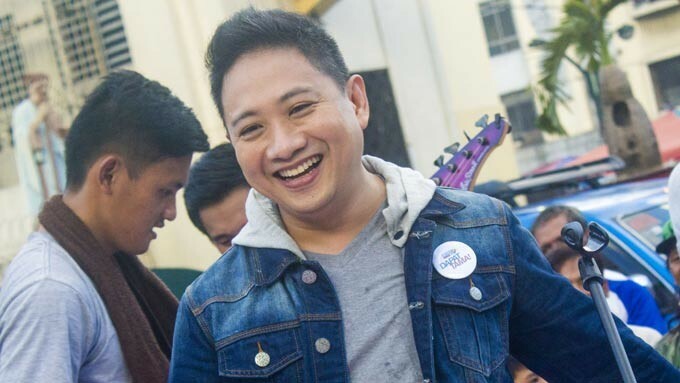 ?yung pag-papaalala sa mga kababayan natin na dapat magkaroon ng tamang eleksyon," says Michael V, also known as Bitoy. He adds, "Maaaring noon ay naisip nila ito [pagboto ng tama] pero hindi nila nagawa. Baka sakaling ngayon ay may pagkakataon na gawin na nila nang tama." The music video of the latest "Dapat Tama!" jingle, to be launched today (Friday, January 15) on primetime newscast 24 Oras, shows Bitoy having his miting de avance against the backdrop of Quiapo Church? ?one of the highly regarded structures that represents Filipino culture. Yet while the typical miting de avance shows candidates advancing their political agenda, Bitoy is instead advocating the importance of doing the right thing come Election Day through the Dapat Tama! Jingle. Infusing humor distinctive of Bitoy, GMA has created a political satire in its election advocacy campaign that aims to empower Filipinos in becoming more informed voters, while tickling their funny bone at the same time. Last December, GMA aired teasers that showed Bitoy giving life to three political characters who used the holiday season to subtly advance their political agenda: Governor Gary Palan reflects the kind of person who runs for office just to grab power for himself and his family; Delly N Sha, on the other hand, is a shrewd mayor always planning under the table deals; and Mimi Hassa--an easy-go-lucky public servant who entertains the voters but lacks the governance skills the country needs. The "Dapat Tama!" advocacy campaign aims for the voting public to understand better the value of exercising one? ?s right to vote by starting from the most basic of it all--carefully assessing all the candidates running for office. But for Bitoy, the tagline "Dapat Tama?sa isip at salita, lalung-lalu na sa gawa!" does not only apply to the voting public but to those running for office, as well. "It? ?s all encompassing. Hindi lang ito para doon sa mga boboto kundi para doon sa mga tumatakbo. Sa mga iboboto, dapat karapat-dapat talaga kayo ihalal dahil sambayanan yung umaasa sa inyo, e. At hindi lang isang tao ang paglilingkuran niyo kundi buong bansa," he says. GMA's "Dapat Tama" was a voter education campaign that was first created by Jessica Soho for the Midterm Senatorial Elections in 2013. The "Dapat Tama!" jingle, co-created and performed by rapper Gloc 9, has won various awards including the 2013 CMMA Best Secular Song and Best Music Video, 2014 New York Festival Bronze World Medal for Music Video, and the 49th Anvil Awards Merit Honors.